Ivan R. Dee Publisher, 9781566636087, 268pp. On the racetrack, history is made two minutes at a time. 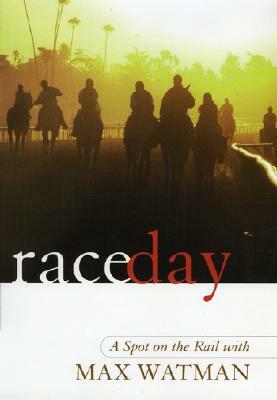 Race Day tells the story of American horse racing through the stories of its most intriguing, most confounding, most entertaining races since the early nineteenth century, including the great tracks where they were run and the people and horses that marvelously came together to make it all happen. Here is Jim Dandy beating Gallant Fox at Saratoga; the first Kentucky Derby at Churchill Downs; Man o' War's Preakness at Pimlico; Johnny Longden's last ride in the San Juan Capistrano at Santa Anita; Secretariat losing the Wood Memorial at Aqueduct; Alydar winning the Bluegrass at Keeneland; John Henry, Bill Shoemaker, and the first Arlington Million; Smarty Jones's heartbreaking loss at the Belmont Stakes; and many more. Throughout Race Day, Max Watman, a seasoned observer of the sport, concentrates on great stories and personalities. He's traveled to each of the tracks, interviewed the principals who are still around, eavesdropped in the track kitchen, stood in the winner's circle, gone to horse libraries. Most of the fun of his book is atmospheric. It starts on May 27, 1823, when sixty thousand people--including most of Congress, Andrew Jackson, and Aaron Burr--packed the Union Race Course on Long Island to watch the match race between American Eclipse representing the North, and Sir Henry representing the South. The race was to be run in four heats, with a flag flown atop the nearby bakery so that those in town might know the fate of their wagers--white for a Northern victory, black for a Southern one. After the first heat, the black flag rose on the rooftop, and the stock market crashed. Race Day is filled with such wonderful stories and illustrated with 20 black-and-white photographs. Max Watman is the regular turf correspondent for the New York Sun and has written about horse racing for the New York Times and the New York City OTB. His work has also appeared in Harper's, the Wall Street Journal, and Parnassus. Mr. Watman is also the fiction chronicler for The New Criterion and an editor of the Nebraska Review. He was raised in the mountains of Virginia and now lives with his wife in Brooklyn, New York.